The clash between Florida State and Miami was already pushed back from September 16 to October 7 due to Hurricane Irma. It could be delayed again due to another tropical system. Weather forced Florida State to alter its football schedule twice last month. Could it happen for a third time this weekend? “We are monitoring the tropical storm and will continue to do so throughout the week," FSU officials said in a statement Wednesday. The National Hurricane Center said in its 11 a.m. forecast Wednesday that a tropical depression in southwestern Caribbean is expected to strengthen into Tropical Storm Nate later today. The storm could also reach hurricane strength by the time it makes landfall along the U.S. Gulf Coast between Louisiana and Florida’s west coast late Sunday, according to the National Hurricane Center. 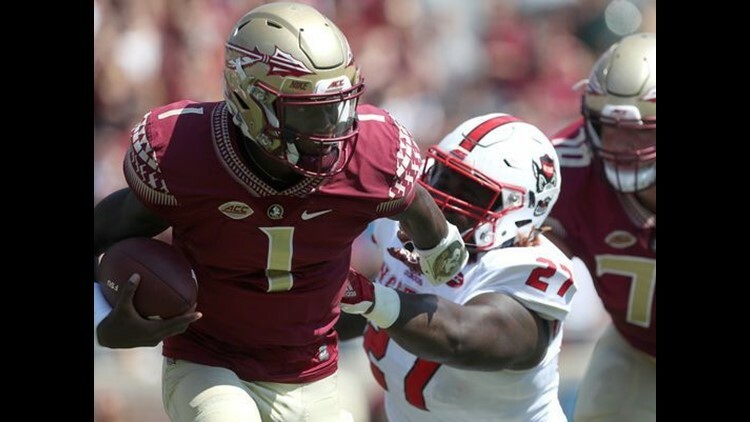 The Seminoles and Miami Hurricanes are scheduled to play Saturday at Doak Campbell Stadium in a game that was rescheduled by the ACC from Sept. 16 due to Hurricane Irma. FSU's home game against Louisiana-Monroe on Sept. 7, was canceled due to Hurricane Irma. That game, however, could still be played later this season.